11 months contract basis under various program of National Health Mission NHM. Interested candidates may attend the walk in interview on 25-05-2017 for the posts of Doctor, Program Office and Consultant. For the post of Rehabilitation Worker walk in interview will be conducted on 26-05-2017. 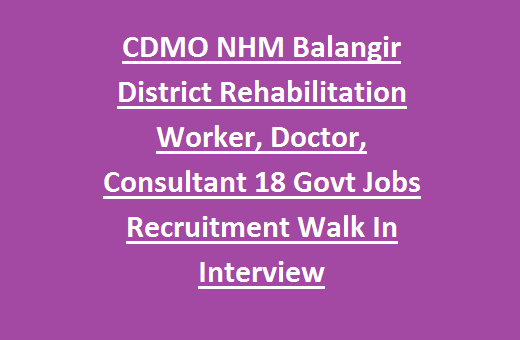 There are total 18 vacancies available in this Balangir District CDMO National Health Mission Programs Recruitment 2017. Details of educational qualifications, experience, age limits and other information is given below for this NHM Balangir District Recruitment 2017. 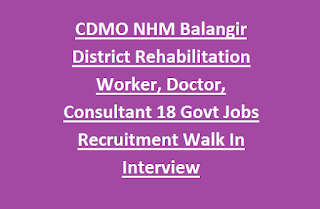 There are total 18 vacancies available in CDMO recruitment of Balangir District. For the post of Rehabilitation Worker as on 01-05-2017 age limits are 21-40 Years. For other posts upper age limit is 65 years. 2. Consultant Medicine-MBBS and MD in Medicine or PG Diploma in Geriatric Medicine. Selection for the above said vacancies will be held based on candidates performance in walk in interview. Interested candidates may download the application form which is available in official notification. Fill all the details and attach the all self attested documents of work experience, educational qualifications, id and address proof and other documents. Original certificates also required for verification in walk in interview.